The next phase of the Liberty Green development is set to break ground soon. The Edge at Liberty Green will contain a series of privately owned mixed-use townhouses in its first phase and larger mixed-use buildings later on. City Properties Group (developers behind the ZirMed Towers, the Henry Clay, and the Whiskey Row Lofts) and AU Associates (developers of the St. Francis building on Broadway) plan to begin construction on the first new building by the end of August. The first building will contain eight units and will take nine or ten months to complete. Three months after the first building breaks ground, a second structure with another eight units will start construction. In the end, the Edge at Liberty Green will contain 285 new townhouse units along with many more condos in the later mid-rise phase. There are four building layouts that will make up the townhouse phase and the first structures will be built around two parks at the intersection of Liberty Street and Hancock Street making them ideally located between the Medical Center to the south and the East Market Street District/Nulu to the north. The design of the new townhouses with feature classic urbanism with a simple modern aesthetic. By connecting the townhouses, the project contributes an urban edge to the area and enhances its urban character. Sunken courts in front of the buildings allow access to units on two levels. Eventually, some buildings could contain shops in these sunken areas. Handicap accessibility is achieved through ramps leading to the sunken level. This would provide even more sidewalk vitality in the area. Already, there has been interest from prospective buyers in the new units and several reservations have already been placed. A furnished model unit is planned for tours as soon as possible. I have been waiting for this project to get underway. I admit I am a little disappointed in the facade on the buildings. When I heard traditional urban townhouse, I expected the exterior to be less stark. Still might be an option for me though. I am also really glad to see this one moving along. In terms of your concern with the facade, I would wait a little bit for a more refined design. 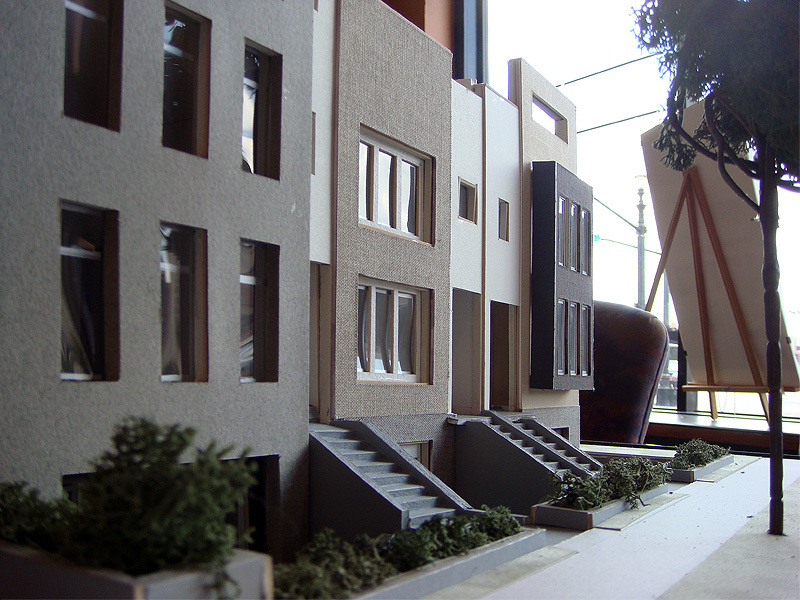 Architectural models like the one pictured are always a little more simplistic than what will actually get built. There are a lot of details like great natural lighting and outdoor living spaces that should reveal themselves closer to construction I imagine. Finally some decent architecture for Liberty Green. What we got so far was cookie-cutter retro, not a creative thought behind it. That is stark contrast to Gallery Square on the northwest corner of Clay and Jefferson. Cudos to Bill Weyland for doing something more creative in this location.